Causes include physiological as well as pathological. Knowledge of physiologic calcifications in the brain parenchyma is essential to avoid misinterpretations. 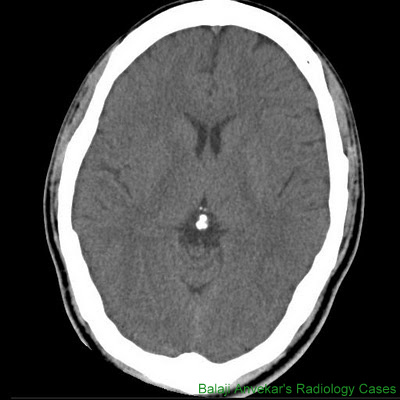 Several pathologic conditions involving the brain are associated with calcifications and the recognition of their appearance and distribution helps to narrow the differential diagnosis. Noncontrast-enhanced CT of the head is the preferred imaging modality over MRI. MRI is quite risky may miss faint calcification. Very common associated with aging , commonly seen in the basal ganglia, pineal gland, falx, tentorium, arachnoid granulations, choroid plexus and the cerebellum. Never clinically significant. 1. Basal ganglionic calcification: bilateral, faint, located within the globus pallidus, less commonly caudate nucleus and the putamen, very common in middle-aged individuals and the elderly. Any calcification other than globus pallidi and before age of 10 is abnormal and should be investigated for underlying metabolic disorders as in this case. 2. Pineal calcification: seen in approximately 40% of normal people by the age of 20 years and usually less than 1 cm in diameter. Larger calcifications should raise concerns for underlying tumor. 3. 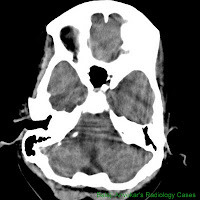 Dural calcifications: Very common in older age groups and are usually located in the falx or the tentorium, usually few. Presence of multiple and extensive dural calcifications or dural calcification in children should raise the suspicion of underlying pathology. 4. choroid plexus calcification: Very common after the age of 40 years. On the other hand, only 2% of children between 0 to 8 years of age and 9.5% of children from 9 to 15 years of age have calcifications of the choroids plexus. 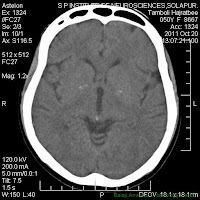 Commonly seen in atrium of lateral ventricles uncommonly in fourth ventricle. 5. Partial volume averaging at the base of skull: apparent appearance due to partial inclusion of bone in the section due to unevenness of bony floor of bony calvarium. 6. Finally, physiologic calcifications can be seen in the cerebellum, with the dentate nucleus being the most common site. 7. Gaint arachnoid granulations, along the transverse and sigmoid sinuses, are also calcified in middle-aged and older people. The phakomatoses are a group of hereditary disorders. Calcifications commonly described in tuberous sclerosis and Sturge-Weber syndrome but can also be seen in neurofibromatosis and basal-cell nevus syndrome. 1. In tuberous sclerosis, Calcified subependymal nodules along the lateral ventricle and caudo thalamic groove. 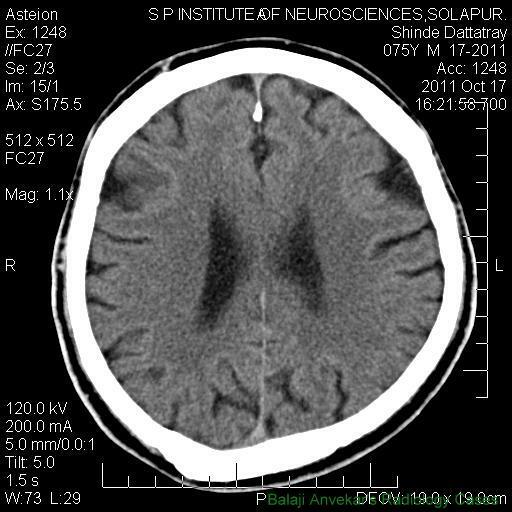 Associated with cortical hamartomas which may show calcification. 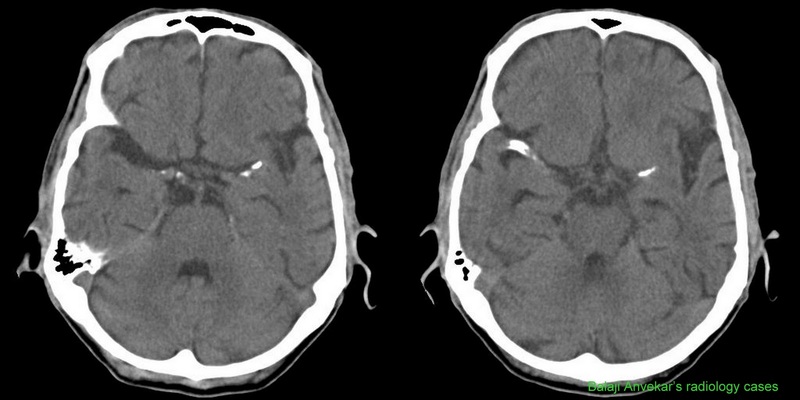 Subependymal giant-cell astrocytomas are another major manifestation of tuberous sclerosis that can present as a calcified nodule. These lesions are larger than the subependymal nodules, show interval growth, enhance on postcontrast images and are located at ornear the foramen of Monro. 2. In Sturge-Weber, Gyriform cortical calcifications with ipsilateal atrophy and enlarged choroid plexus. 3. In neurofibromatosis type 2 (NF2) tumeral calcification of like meningiomas and nontumoral calcifications like disproportionate calcification of choroid plexus in the lateral ventricles and nodular calcifications of the cerebellum being most commonly observed. 4. In basal-cell nevus syndrome early dural calcifications are a common manifestation involve the falx, the diaphragma sella and the tentorium. These are also locations of physiologic calcifications, but in patients with basal-cell nevus syndrome, the calcifications appear in younger age groups. Calcifications in the arterial wall of large intracranial vessels are common and should be mentioned in the report because of their association with atherosclerosis, an independent risk factor for stroke. The carotid siphon is the most commonly affected vessel, while calcifications in the anterior and middle cerebral arteries and the vertebrobasilar system are less common. Calcification patterns associated with vascular pathology such as AVM nidus, aneurysms, cavernoma and capillary talengictesia. 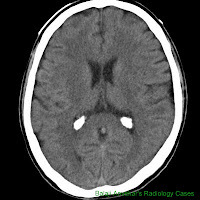 Intracranial calcifications are common in patients with congenital infections, but their appearance is not specific because they reflect dystrophic calcifications similar to any chronic brain injury. 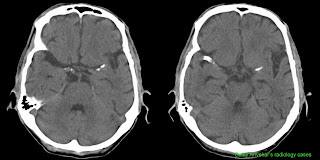 Basal ganglia and cortical calcifications are common features of all infections that constitute the TORCH syndrome (toxoplasmosis, other, rubella, cytomegalovirus, herpes simplex virus). Cytomegalovirus and toxoplasmosis infections result in peri-ventricular and subependymal calcifications. Interestingly, calcifications in patients infected with toxoplasmosis may resolve after treatment. Congenital HIV infection is associated with periventricular frontal white-matter and cerebellar calcifications. 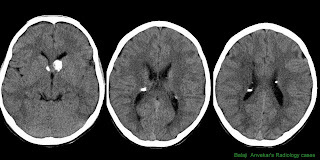 Congenital herpes (HSV-2) infection is associated with thalamic, periventricular, and punctate cortical or extensive gyral calcifications. Cysticercosis, tuberculosis, HIV and cryptococcus are the most common acquired intracranial infections typically associated with calcifications. In cysticercosis calcifications are seen in the dead larva (granular-nodular stage) and the typical appearance is that of a small, calcified cyst containing an eccentric calcified nodule that represents the dead scolex. 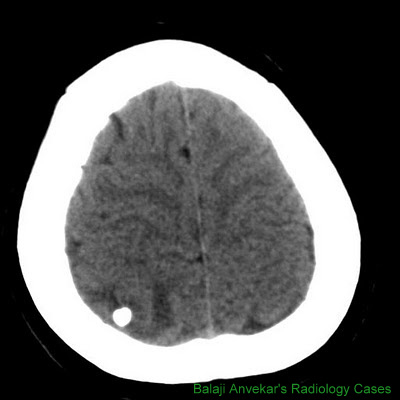 The most common locations for the calcifications are the subaracnhoid spaces in the convexities, ventricles, and basal cisterns and the brain parenchyma, especially the gray-white matter junction. Tuberculosis results in calcified parenchymal granulomata in 10% to 20% of patients; meningeal calcifications are much less common. HIV encephalitis is associated with basal ganglia calcification. Cryptococcus affects immunocompromised patients and calcifications can be seen in both the brain parenchyma and the leptomeninges. Sarcoidosis involves the leptomeninges, granulomas of the pituitary stalk and the optic chiasm. Calcified sarcoid granulomas can also be seen in the pituitary, pons, hypothalamus and the periventricular white matter. Systemic lupus erythematosus associated with cerebral calcifications in the basal ganglia, thalamus, cerebellum and centrum semiovale. Commonly calcified intracranial tumors include the oligodendrogliomas, low-grade astrocytomas, craniopharyngiomas, meningiomas, pineal gland tumors and the ependymomas. In some instances, the presence and pattern of calcification can be essentially pathognomonic as in the case of oligodendrogliomas and craniopharyngiomas. The presence or absence of calcifications is not related to the benign or malignant nature of the tumor. Dermoid and epidermoid tumors show peripheral stippled calcification, teratomas show internal calcification. Pituitary adenomas do not calcify frequently. Pericallosal and interhemispheric lipoma with calcification. Metabolic disorders affecting the calcium homeostasis predominantly involve the basal ganglia. Although the pattern is similar to the physiologic, age-related calcifications, they appear at younger ages and are often progressive. Basal ganglia, thalami, subcortical white matter and dentate nuclei calcifications have been described. Hypothyroidism is also associated with basal ganglia and cerebellar calcifications. Rare idiopathic disorders such as Fahr disease. 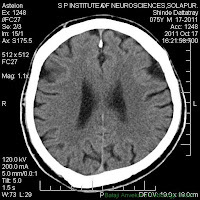 Seen as a chronic sequelae of trauma, surgery, ischemia and radiation therapy, often associated with encephalomalacia and gliosis. 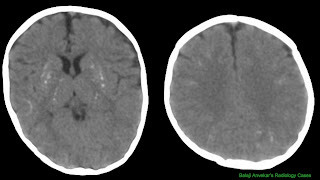 Post traumatic calcifications have been described in the capsule surrounding both chronic subdural and epidural hematomas. Radiation–therapy- and chemotherapy-related calcifications are of three main types. Although radiation therapy and chemotherapy probably have a synergistic role in the pathogenesis, radiation is the dominant factor in mineralizing microangiopathy. 1. How small calcifications can a CT-scan detect? 2. 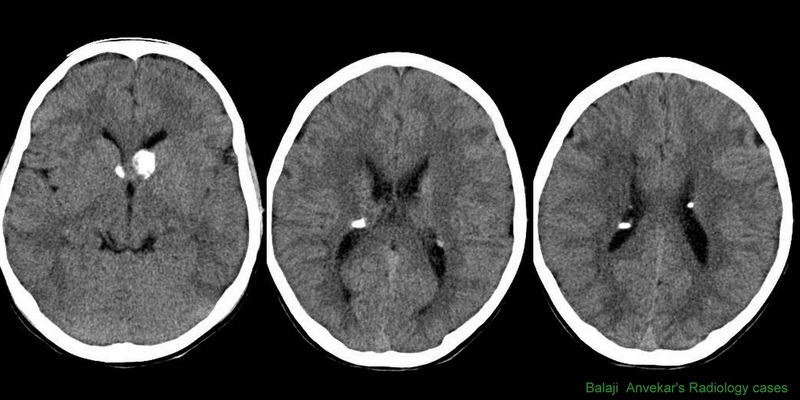 Am I right that calcifications in the brain don't need to show symptoms? 3. How much calcification do you need to show symptoms? If you have diffuse symptoms are the calcifications always detectable? 4. 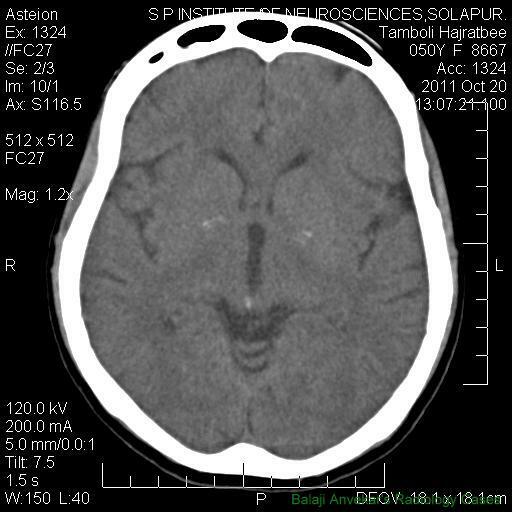 Is it possible that there can be more calcifications in one side of the brain? 5. If I suspect calcification what should I do? That was very helpful ..thanku..
Great effort to share knowledge . esta informacion me ayudo mucho me educo , gracias por su tiempo he informacion .